It’s difficult to find a restaurant upon which the whole family can agree. Usually, when I give my sons a choice, they list off the big chains. In an effort to broaden their horizons, I took them to “work” as I checked out Casa-Di-Pizza. A.J., Billy and I entered the restaurant with a bit of confusion. While I had heard this was a sit-down restaurant, in front of us was a pizza shop with a few tables and counters. It took a few minutes of looking around to spot the sign leading us to the dining area. Another sign directed us to seat ourselves, and we weaved our way around six tables situated tightly together before settling into a booth. The casual atmosphere was inviting. We were greeted with a mix of Italian/American décor, with a placemat that educated us about Italy and a wall-size mural of the Buffalo skyline beside our booth. 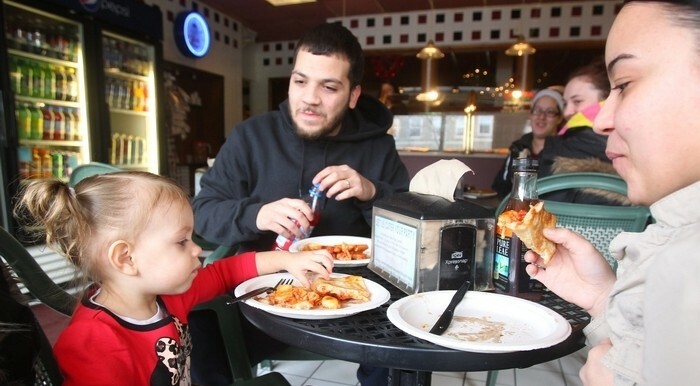 About a dozen diners of all ages enjoyed their meals as we looked over the menu, which featured pizza, subs and pasta specials. Billy decided beforehand that he would have cheese pizza. Each slice was $2.07, and I estimated he would finish two, so we ordered the small pie ($9.95, six slices). Since Billy alternates between pizza and macaroni and cheese at home several nights a week due to how picky he is, this ensured that Mommy wouldn’t have to cook for him the following night. When the pizza was delivered, Billy’s eyes popped over how large it was. One slice nearly covered his dish, and that’s all he could handle. Billy usually picks off most of the cheese from store-bought pizzas, but he finished every last strand of the fresh mozzarella piled onto his slice. A.J. is more daring in his tastes, so he opted for the whole hot steak Caesar sub on a white roll (normally $9.29, $5.49 because it was sub of the month). Similar to chicken Caesar, the 12-incher featured tender steak, Romano cheese, romaine lettuce, tomato and a zesty Caesar mayonnaise. A big eater, A.J. was impressed with the portion and had no room for dessert. I ordered the whole chicken parmigiana hot sub ($8.99). It was as large as A.J.’s, and I could only get through half before I threw in the napkin. While I usually gravitate toward wheat bread, which was available, I thought “when in Rome” and chose an Italian roll, which was toasted to perfection with a soft center and crunchy edges. The tomato sauce had a nice spice and thickness, puddles of mozzarella covered every inch, and the breaded chicken strips were large enough to cover to the edges of the roll. The menu also featured pasta entrees, including spaghetti, ravioli, seafood and eggplant parm ($9.99 to $12.99) and cannolis, fried dough and other desserts ($2.25 to $4.95). For children younger than 12, a special section offered spaghetti, mac and cheese, chicken fingers, etc., with beverage and ice cream ($4.69). Hours: 11:30 a.m. to midnight Monday to Saturday; noon to 11 p.m. Sunday. Pizza shop open for takeout until 4 a.m. Friday and Saturday. Extras: Wheat penne and gluten-free options available; two dining rooms, two banquet facilities to seat up to 200 people; drop-off catering; owners also own JJ’s Sports Bar next door.